The Stanley Cup playoffs begin today, with the Presidents’ Trophy-winning Tampa Bay Lighting entering as heavy betting favorites. And for good reason: Their regular season resume is impeccable. They earned 128 points by winning 62 games, placing them in a tie with the 1995-96 Detroit Red Wings for the most regular-season wins in league history. 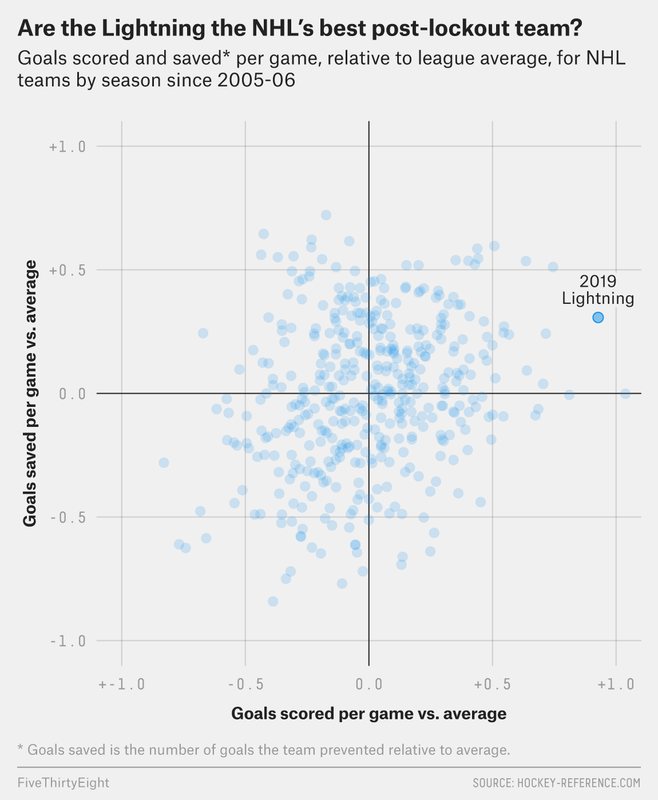 En route to all those wins, the Bolts led the NHL in goals scored, powerplay goals scored, shooting percentage and penalty kill percentage1 and finished third in save percentage. Nikita Kucherov became the first player in more than a decade to register 120 or more points, and Steven Stamkos had the most productive season of his already immensely productive career. Tampa is a balanced juggernaut, and every other team should be very afraid of it. Still, NHL favorites3 haven’t had it all that bad since the lockout, especially when compared with the other three major North American men’s leagues. Only NBA favorites have had better championship odds going into the playoffs over the past 13 years. * Based on a logit regression between per-game scoring differential and championships won for each league. While it might not be as inevitable as, say, the Golden State Warriors winning the NBA title in 2018 (or 2017 or 2015), Tampa’s regular-season dominance suggests that it’s poised to continue this trend. The Bolts scored 103 more goals than they conceded during the regular season; the next best mark was set by the Calgary Flames, who posted a +62 goal differential. The gulf between best and second-best is immense, and it underscores Tampa’s historic regular-season greatness. And indeed, Tampa may be the NHL’s best team since the lockout. Hockey-Reference.com’s Simple Rating System (SRS), which estimates the strength of every team in the NHL,4 reiterates just how special this Bolts group is. From 2005-06 to 2017-18, just three teams finished the regular season with an SRS better than 1, and no team eclipsed 1.2. The most recent team to do so — the 2012-13 Chicago Blackhawks — won the Stanley Cup. Tampa finished the 2018-19 regular season with an SRS of 1.21. All signs are pointing to late-spring celebrations on the Gulf Coast. Tampa’s only real concern at the moment is the health of Victor Hedman, the reigning Norris Trophy winner for the top defenseman. The Swede missed Tampa’s final three games with an “upper-body injury.” Hedman has a history of concussions, and “upper-body injury” is often NHL front-office code for concussion. The slick-skating defenseman is Tampa’s fourth-highest scorer, its power-play quarterback and the leader of a rearguard partially responsible for that gaudy goal differential. The Bolts can probably survive a first-round tilt against a slightly better-than-average Blue Jackets team without Hedman, but things might not be as easy against subsequent teams. If there’s a cautionary tale for this iteration of the Bolts, it’s that Red Wings team from 1995-96: Detroit earned the second-most regular-season points in NHL history and boasted two of the league’s best offensive players (Sergei Fedorov and Steve Yzerman) and the league’s reigning Norris Trophy winner (Paul Coffey) and yet failed to advance beyond the Western Conference finals. In the NHL, history is written between April and June, not October and April. Tampa is on top of the hockey world at the moment. But that world could change significantly in a matter of weeks. Players in the NHL are scoring at a prodigious pace. Tampa Bay’s Nikita Kucherov is on pace to score 125 points, which would be tied for the highest point tally of the new millennium. If they keep up their current clip, Edmonton’s Connor McDavid would score 122 points, Chicago’s Patrick Kane 119 points and Colorado’s Mikko Rantanen 117 points. All of these point totals would smash each player’s previous career high. This makes sense given the climate of the NHL this season — it’s the highest-scoring season since the one that took place immediately after the lockout of 2004-05. There are currently 40 players scoring at least a point per game.1 If the season ended today, it would be the highest number since 1995-96, when 42 finished the season with a point per game or better. This is excellent news for a league that’s constantly tinkering with its rulebook to increase scoring. For the first time in more than a decade, the average goals scored per NHL game has surpassed 6. But unlike previous spikes in scoring, there weren’t any sweeping changes made to the rulebook before the season,2 so what exactly is going on? An obvious stat to look at is the average number of power-play opportunities teams are getting each game. More man advantages, it would seem, might lead to more quality scoring opportunities. But power-play opportunities per game have actually decreased steadily since the lockout of 2004-05 and are static when compared with last season, when the average goals scored per game was below 6. Shooters do appear to be taking better shots in five-on-five scenarios. The average for the league in expected goals per 60 minutes per team3 is 2.38, according to data from Corsica Hockey — up from 2.19 in 2015-16. 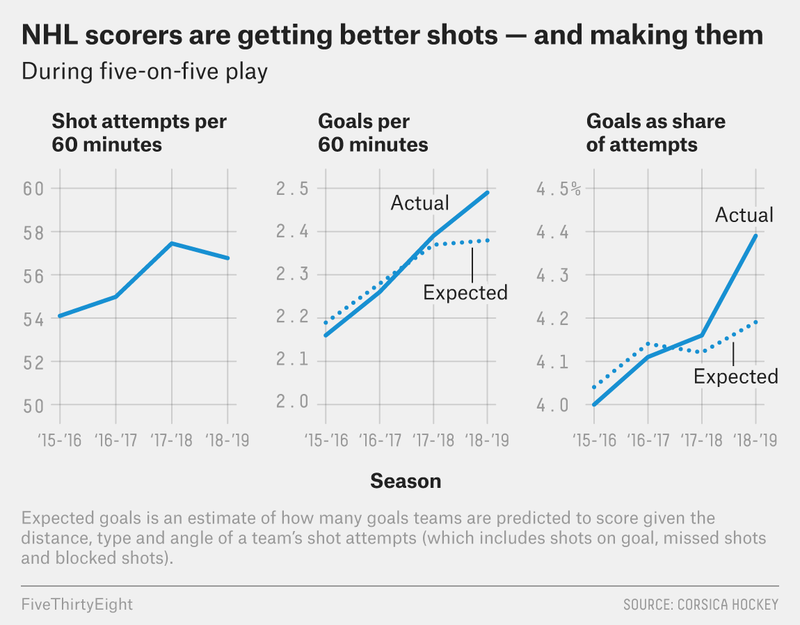 And shooters are actually performing better than the expected goals model suggests they should be: The league average goals per 60 minutes per team is 2.49. A 10th of a goal may not seem like a lot, but it translates to about 254 more goals scored per season. Shots against per game have remained fairly stable since the lockout of 2004-05, which makes it somewhat difficult to explain the sudden glut. It could be that the ongoing analytics boom in hockey has affected a change in the old “get the puck to the net however possible” evangelism that once was pre-eminent. It’s true that the puck won’t go into the net unless it’s guided toward the net, but not all shots are created equal: An unimpeded shot from between the dots has a much better chance of hitting the twine than a shot taken from the blue line and directed toward a bunch of traffic in front of the net, for example. If expected goals are any indication, players are taking smarter shots — not more shots — than they did in the past, and that’s leading to more goals. We might expect that slumping goaltending could also provide part of the answer. The average save percentage (.908) across the NHL is the lowest it’s been in a decade. But if we isolate goaltenders who were roughly in their prime (between the ages 25 and 31) in both 2015-16 and 2018-19 — presumably a group whose inherent skills haven’t changed very much even as the NHL’s goals-per-game average has — their average save percentage has dipped by an astounding 12 points over that span. By comparison, the overall league average in save percentage is down by only 7 points, which indicates that goaltenders who were not in the goalie population in 2015-16 are having a better time adjusting to the league than goalies who were already around — even ones still in their primes. It’s fair to conclude, then, that goaltending has gotten demonstrably more difficult in a short period of time, and veteran goalies appear to have had a hard time adapting to shooters who have figured out how to take smarter and more dangerous shots. This is all in sharp contrast to the amount of scoring that occurred in the past decade-plus. In the past, changes to the NHL rulebook have had a bubble effect: Scoring increases immediately but regresses within a season or two. That was certainly the case in 2005-06, which was defined by a spate of rule changes and a cadre of whistle-happy referees. That season, the size of goaltender equipment was reduced; the two-line offsides rule was abolished; the neutral zone was reduced by 4 feet, expanding the space each team had to mount an offensive zone attack; and goaltenders were no longer allowed to play the puck anywhere they wanted behind the goal line, instead restricted to a trapezoid behind their own net. Power-play opportunities skyrocketed to 5.85 per team per game, up by 1.61 from 2003-04. This all meant that scoring jumped from 5.14 goals per game in 2003-04 to 6.16 goals per game in 2005-06. The boost was short-lived, however. Scoring dipped beneath 6 goals per game the following season, and as the decade post-lockout progressed, scoring continued to suffer. Power-play opportunities declined drastically, goaltenders got better, and the average goals scored per game stayed below 6 for a dozen seasons. Until this season. Whether the scoring uptick can be attributed to a culmination of rule changes, smarter shot selection, worse goaltending or evolved tactics — or some combination of all of that — one thing is certain: The NHL is a scorer’s league again, and the 2018-19 iteration is the most entertaining in nearly three decades.